This. This is what I love about blogging. This is a re-run inside a re-run, the bulk of which was written nearly 9 years ago for a column I wrote for the Post-Tribune. 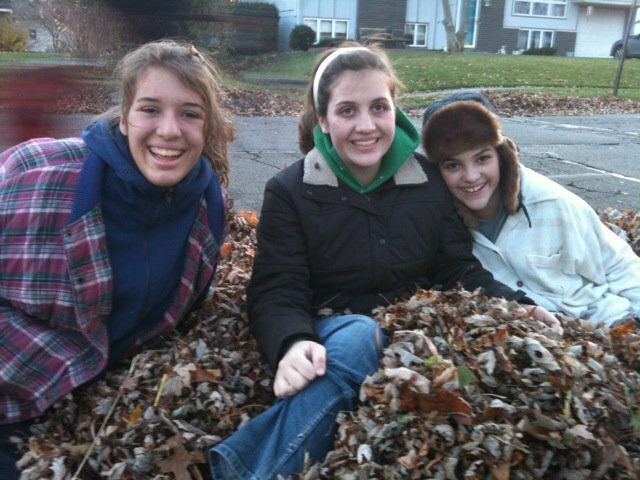 I remember that day, watching those leaves, like it was yesterday. But I don’t remember what I wore to work just yesterday. What matters doesn’t always need to be written down, but when you do, it not only matters … it lasts. Today is a work-at-home day, so I was allowed to watch my youngest as she waited for the bus. I stood on the other side of the window, in my bathrobe, holding a less than steaming but terrificly delicious cup of fresh-roasted Highlander Grogg, watching her. The trees in the front yard were/are shedding their leaves rapidly this morning, a steady shower of orange, red and gold. The big ginger cat sat at my feet, his tail twitching as he, too, watched the leaves drop from the sky. Oh, he wanted to wrestle them, I saw it in his tail. This scene reminded me of a column I wrote two years ago. I found it and share it with you now. I continue to be awed (and odd). Enjoy your fall day.